After gauging student feedback, Student Government Board has extinguished a resolution to support a tobacco-free campus. 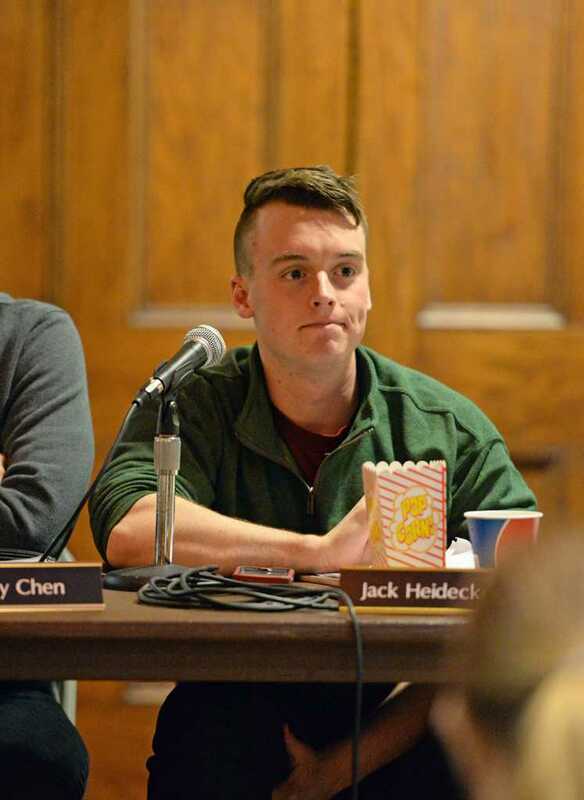 At its weekly public meeting Wednesday night, SGB member Jack Heidecker made a motion to remove his tobacco-ban bill, a resolution that said SGB would support University efforts to make Pitt a tobacco-free campus. A committee consisting of students, faculty and staff, which Heidecker serves on, could still draw up a policy to make campus tobacco-free, but it won’t have SGB’s official backing. After introducing the legislation last week, SGB posted a survey online asking for student feedback on the bill. About 750 students voted on the policy, which 50.02 percent favored and about 47 percent opposed. Three percent voted that they were “unsure” whether they supported a tobacco-free policy. Heidecker, who authored the resolution and has made the tobacco-free campus policy his top project for most of his term, said the Board had not gauged student interest on the project before last week, as he planned the survey’s release to accompany the upcoming resolution. According to SGB President Nasreen Harun, the Board felt that it was unsure on how to vote given the survey results, and wanted to make sure it was accurately representing the students. Other Board members, including Lia Petrose, said because the survey results were too close, they didn’t feel comfortable voting on the resolution. Heidecker does not plan to introduce another resolution or reopen the survey to students. According to Heidecker, the fact that the Board did not take an official position on a pending University policy does not mean that efforts to ban tobacco on campus will come to a halt. The Student Health Advisory Board, along with the tobacco-free task force and other groups, has been drafting a policy since the fall semester that would ban tobacco from campus. Heidecker said the task force — a group of Pitt faculty members from the Graduate School of Public Health, the University Senate Council and SHAB — will continue to draft a proposal to make Pitt tobacco-free. Heidecker said he plans to continue working with SHAB to make Pitt tobacco-free in the future. In other action, Petrose introduced a bill proposing that SGB renew its subscription to the Collegiate Readership Program, which provides free daily newspapers to Pitt students. SGB has funded the program since 2011. It offers free USA Today, New York Times and Pittsburgh Post-Gazette newspapers to students at newsstands around campus with a Pitt ID. The Board will vote on the bill at next week’s meeting. The Board renews its subscription to the Collegiate Readership Program by a resolution every year. According to Petrose, from Aug. 31, 2015, to April 1, 2016, 24,600 students have picked up copies of the New York Times, and 22,661 students have picked up copies of USA Today since the beginning of the school year. “We wanted to make sure it was being used, and we felt [the program] was sufficiently used,” Petrose said. According to the data, the average sale of newspapers in the program is 369 papers per day. “SGB only has to pay for copies actually taken out,” Petrose said. “The rest of the cost is absorbed by the [newspapers] themselves.” Petrose said SGB does not know the number of copies Pitt gets from the newspapers. SGB also voted in Allocations Committee appointments Stephen Berry, Gianna Callisto, John Brennan, JP Leskovich, Zach Ward, Naran Babha, Erin McMahon, Gabby Galliero, Brian Crowley and Marcus Robinson. Madeline Guido will take over as Committee chair. The Women’s Water Polo Club requested $2,704 for regional league dues. SGB approved $2,000 and denied $704. Pittsburgh Club Baseball requested $2,144.48 for a tournament at Cornell University. SGB approved the request in full.